As many as six power plants in the path of Hurricane Michael have idled operations out of precaution, removing more than 1,230 megawatts of power generation from the grid. Duke Energy's Oconee nuclear power plant, located in Seneca, South Carolina, which already was in the process of ramping down for a planned refueling outage this weekend, is making preparations for the storm. At least 227,700 barrels per day (BBL/d) of crude oil and 248 million standard cubic feet per day (MMSCFD) of natural gas capacity is offline from idled offshore platforms. These platforms could quickly resume operations once the storm has passed. Numerous industrial plants, ranging from seafood processing facilities to lumber mills and industrial manufacturing, have closed operations as a result of this storm. The U.S. Coast Guard announced port status ZULU (a status that closes port operations completely until further notice) for the Gulf Intracoastal Waterways in the region, the Port of Panama City and the Port of Pensacola. Rail companies have moved or secured rolling stock in the storm's path. 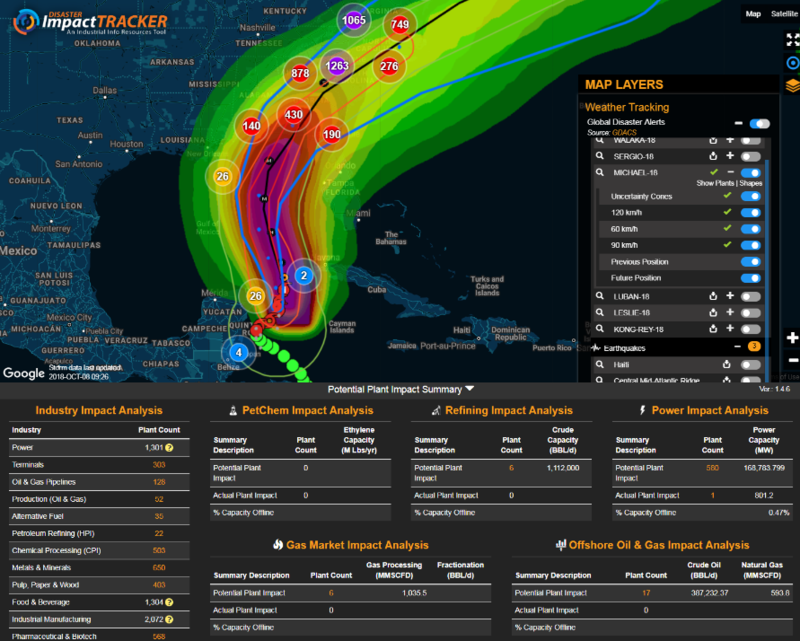 Get the latest actual and potential plant impact results from this storm with our Disaster Impact Tracker tool. Hurricane Michael is rapidly making its way into the Gulf of Mexico, where it is expected to gain momentum and speed over the next 24 hours, potentially reaching the U.S. coast on late Tuesday or early Wednesday. 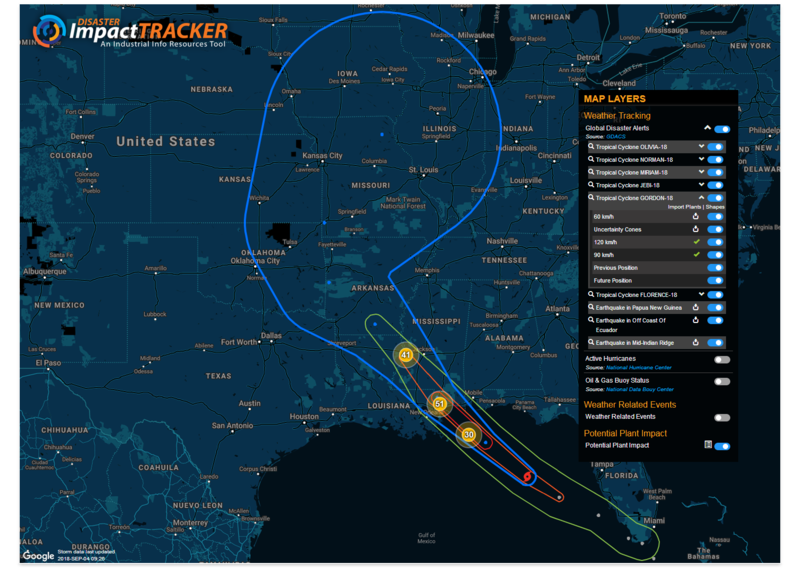 Based on current models of the storm, Hurricane Michael is expected to track just east of a large cluster of 17 manned offshore platforms with a total capacity equal to 387,000 BBL/d, or 18% of the total Gulf of Mexico capability. At the time this alert was published, there were three offshore platforms confirmed to be removing nonessential personnel, although each of the rigs is planning to remain operational. Hurricane Michael is expected to increase in strength to a Category 2 storm overnight, with the potential of increasing to a Category 3 storm before landfall. Based on storm path models on Monday, landfall will likely be in the central panhandle of Florida, missing many of the largest power plants and refineries in the region. 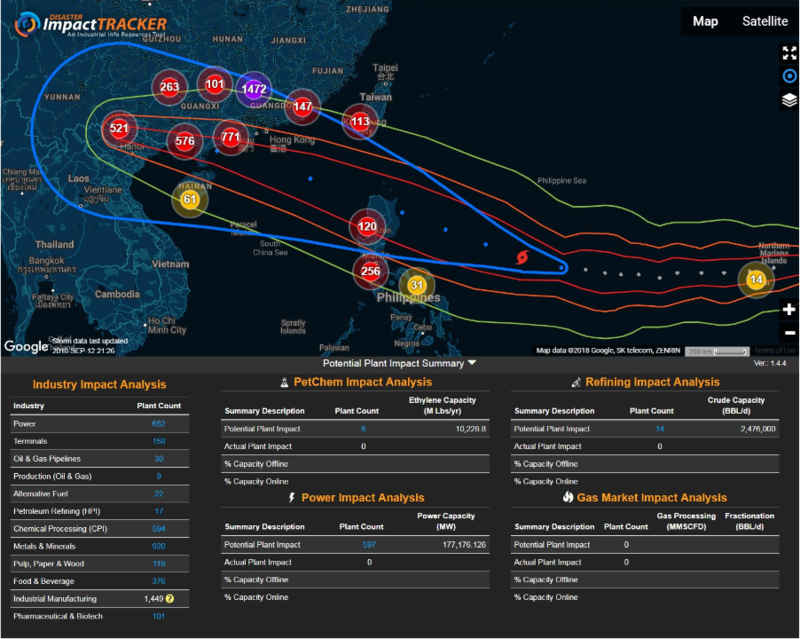 To get the latest Potential Plant Impact summaries, please visit our Disaster Impact Tracker tool. Kong-rey currently is considered a super typhoon, equivalent to a Category 5 hurricane, and is moving toward Japan's Ryukyu Islands, which were swept by extreme winds only a week ago due to Typhoon Trami. Kong-rey is expected to make landfall on the southernmost portion of Japan on Friday this week as a Category 2 storm, bringing with it several inches of rain and then progressing to the eastern shores of South Korea, where the storm is expect to lose strength before making landfall as a potential Category 1 storm. 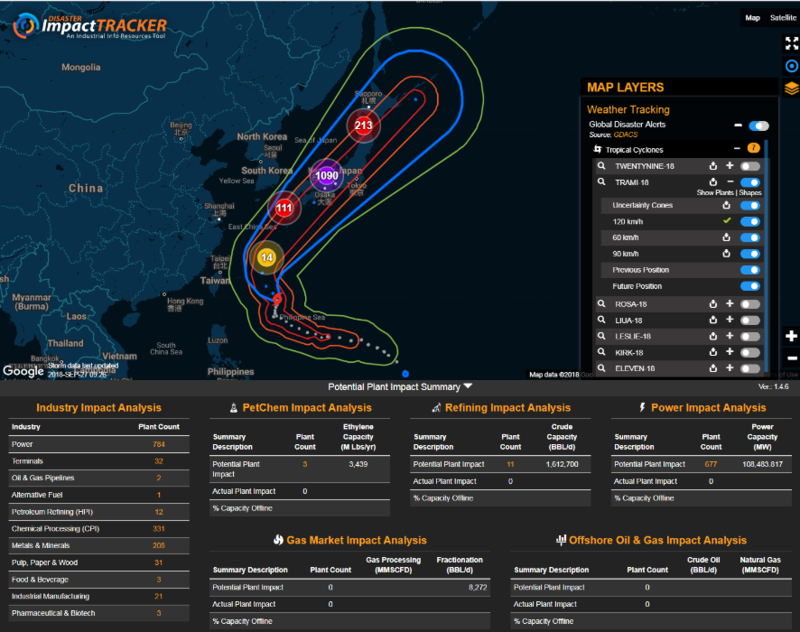 Based on Industrial Info's Disaster Impact Tracker, more than 110 power, refining and petrochemical plants lie within the storm's current path across South Korea. Based on predictions that the storm will lose much of its strength prior to making landfall in this region over the weekend, the interruption to industrial plant operations seems minimal. Industrial Info's research teams will closely monitor the plants in the storm's path and report any damage or offline events as part of the Disaster Impact Tracker. Currently a Category 3 class storm, Typhoon Trami is advancing toward Japan and is expected to bring significant wind, rain and potential flash flooding to the southern parts of Japan by Friday evening or Saturday morning. In the storm's current trajectory there are more than a dozen industrial plants, including crude oil terminals and power stations, which will be very close to the center of the storm's path as it crosses Okinawa. Over the weekend, as the storm reaches mainland Japan, at least three crude oil refineries and one petrochemical plant located near Osaka could be impacted by the storm. 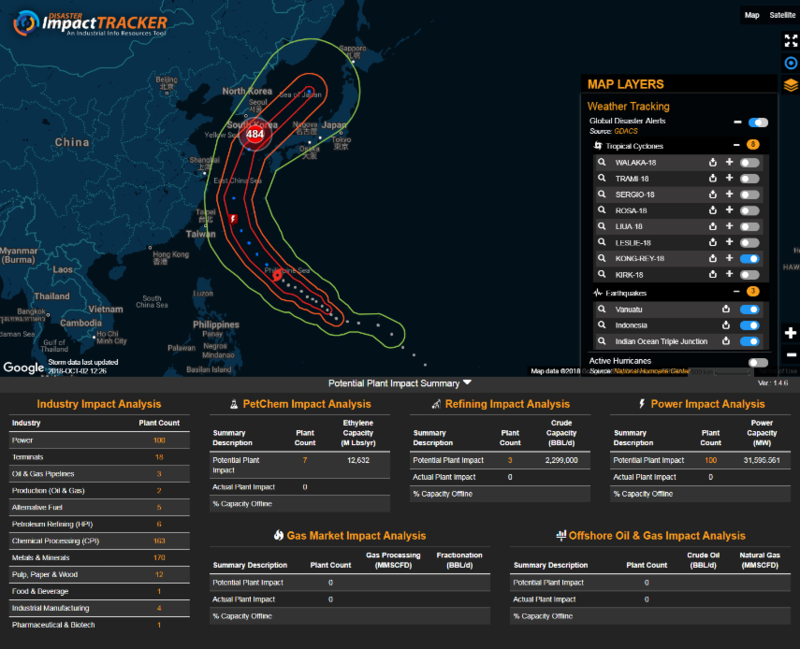 Based on its current projected path, no nuclear power plants appear to be threatened by the typhoon. Operations for marine ports and terminals, rail transportation and power distribution systems will be interrupted as the storm makes landfall. 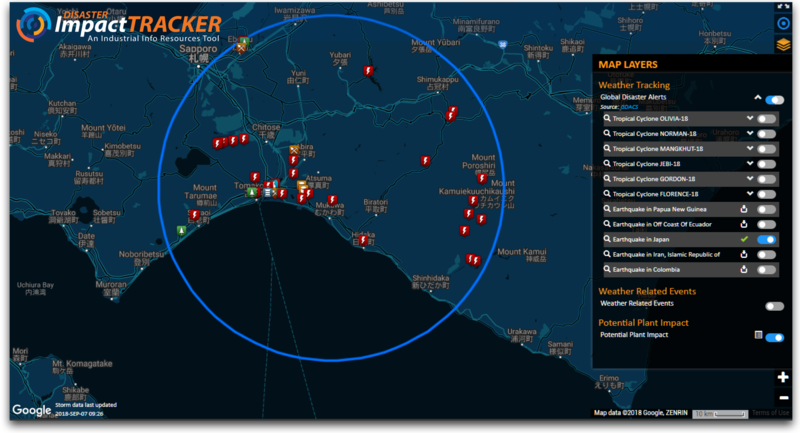 Industrial Info's research team will closely monitor the plants potentially affected by the storm and report outages via our Offline Event tools and viewable in the Disaster Impact Tracker. Now a tropical depression, Florence has unloaded feet of rain in parts of the Carolinas, and several industrial plants remain idle as they assess damage, wait for flood waters to recede and transportation systems to return to full operations. Duke Energy's two units at the Brunswick Nuclear Plant remain offline despite no indication of storm-related damage, as roads have made it impossible for plant staff to reach the plant. While power transmission remains a challenge for many, power generation assets have fared quite well overall in the wake of the storm, with only a small number of power plants currently offline. Marine operations in North Carolina, such as the ports of Wilmington and Morehead City, remain closed through Wednesday, with reports indicating warehouse and other structural damage, as well as a significant number of empty containers that need to be cleared. Ports in Virginia and Georgia are all on normal operating schedules. A CSX train derailed on Sunday near Lilesville, North Carolina, due to a washed out track, but most rail transportation has resumed and crews are carefully assessing potential damage. Industrial Info's research teams called on hundreds of industrial plants across many industries in the region over the weekend, confirming that despite roof damage, uprooted trees and street flooding, most plants suffered very little damage. The most significant hindrance in getting operations back online will be staffing and access to plants where roads or major transportation corridors are still closed. The GE Hitachi Nuclear Energy Americas LLC (GEH) plant in Wilmington, North Carolina, which produces nuclear fuel rods, will remain closed for at least two weeks due to minor building damage and general grounds cleaning to remove tree debris and other materials. The Philippines, Taiwan and southeastern China have issued emergency alerts and halted all shipping as Super Typhoon Mangkhut remains a Category 5 storm. The biggest threat are the extreme winds that have been measured in excess of 180 miles per hour. In the Philippines, major industrial concerns center on damage to agricultural crops, windfarms and hydro-power generating stations. The storm's current path takes it across 64 industrial plants in the Philippines, including 37 power plants producing 3,137 megawatts. As it progresses, Mangkhut could damage a high number of power plants, along with steel mills and petroleum refinery complexes, in Kaohsiung, Taiwan and China's Guandong Province. The typhoon is projected to continue toward the southern provinces of China, where it will intersect with an estimated 1,400 industrial plants. In the Chinese energy sector, there are at least six (6) petroleum refineries in the storm's current path that process more than 860,000 barrels per day (BBL/d) of crude oil, along with a 2,200 million-pound-per-year naphtha ethylene plant. More than 90 power plants producing more than 18,000 megawatts lie in the projected path of the storm's most extreme wind. Industrial Info's research team will continue to monitor the storm closely and report which plants have the greatest likelihood of being impacted by Mangkhut. Hurricane Florence is expected to skirt along the coast line for the remainder of today and into the weekend as it drops potentially record levels of rain. The slow movement of the storm is expected to result in inland rainfall of as much as 20 to 25 inches,causing rivers to rise out of their banks and resulting in severe flash flooding across a very large area. North Carolina Electric Membership Corporation's Buxton Peaking Plant on the Outer Banks is damaged to an unknown extent. Duke Energy has indicated damage to at least five solar plants. Duke's Marshall, Allen, Sutton and Weatherspoon plants in North Carolina are all secure with no damage,but the company idled both units at its Brunswick Nuclear plant in North Carolina on Thursday. Duke Energy was reporting more 340,000 customers without power as of Friday morning, but said in a tweet it anticipates 1 million to 3 million outages across the Carolinas. U.S. military bases in the region are utilizing their microgrid systems at this time. The number of potentially impacted industrial plants remains much the same, with more than 850 industrial plants at risk of tornados, high winds and flood waters. More than 40 pharmaceutical plants are in the immediate area of the storm, and major drug companies have shifted production of critical drugs to non-impacted plants to ensure no shortage of critical products. Fuel and oil terminals have been idled in the affected areas, and this could influence gas prices across the region. Ports in South Carolina remain closed through tomorrow, and those in North Carolina will be closed today with word of tomorrow's status expected later in the evening. Ports in Georgia have limited their operations. Industrial Info's research teams will immediately begin assessing which industrial plants suffered damage, and once the flood waters have receded, determine which plants remain offline. 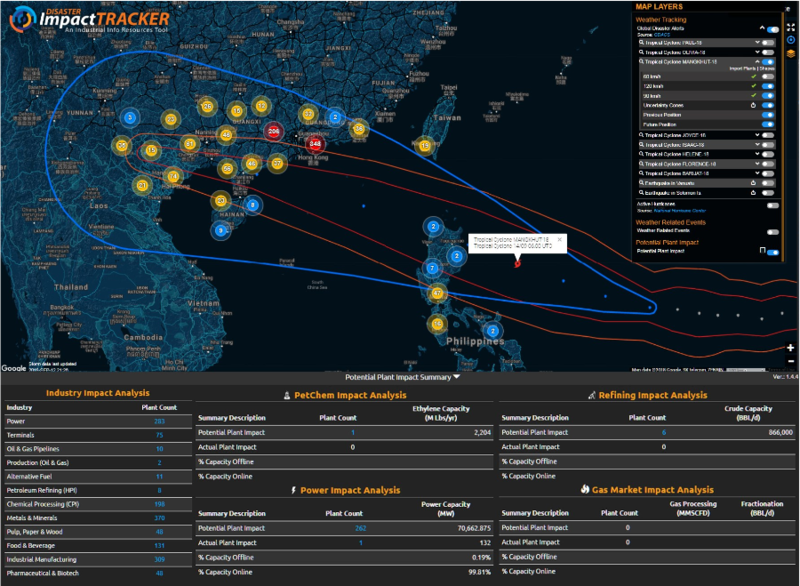 Check the Disaster Impact Tracker frequently for updates. As a Category 5 storm, Typhoon Mangkhut is considered a Super Typhoon by those in its path. The storm is expected to make landfall Saturday in northern Luzon in the Philippines, with winds predicted to reach 180 miles per hour. 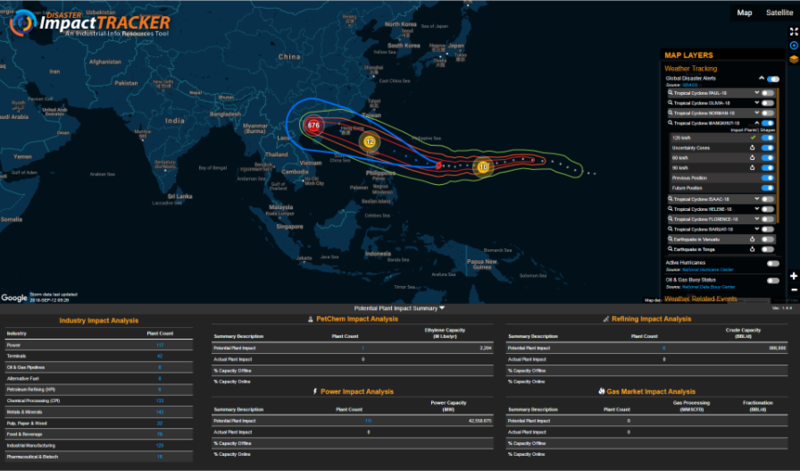 As the storm crosses the Philippines, extreme winds and rain will potentially impact 64 industrial plants, including 37 power plants producing 3,137 mega-watts. The typhoon is projected to continue toward the southern provinces of China, where it could intersect with thousands of industrial plants. In the Chinese energy sector, there are at least six (6) petroleum refineries in the storm's current path that pro-cess more than 860,000 barrels per day (BBL/d) of crude oil, along with a 2,200 million-pound-per-year naphtha ethylene plant. More than 90 power plants producing more than 18,000 megawatts lie in the projected path of the storm's most extreme wind and rain, although movement of the storm over the next few days could change this outcome significantly, depending on where the storm makes landfall. Hurricane Florence is forecast to move into South Carolina today as the storm slowly makes a more southerly turn. The trajectory puts at least three nuclear power plants, that combined produce 3,548 megawatts, in the direct path of the most intense wind bands predicted for the storm. Duke Energy Progress LLC owns two of these plants, the HB Robinson Nuclear Power Station and the Brunswick Nuclear Power Station. The third plant, the Virgil C Summer Nuclear Station, belongs to South Carolina Electric & Gas Company. Each of these plants operate under rigorous Nuclear Regulatory Commission (NRC) safety and security compliance measures to ensure their safety during severe storms. Several large steel mills and related industry facilities are closing in advance of the storm, including Dominion Terminal Associate's 22 million ton-per-year coal terminal, Liberty House Group's 750,000 ton-per-year steel wire minimill in Georgetown, South Carolina, Vulcraft Incorporated's steel joist plant in Florence, South Carolina, and JW Aluminum Company's aluminum sheet mill in Goose Creek, South Carolina. Most large industrial complexes plan to remain idle through the weekend, with restarts depending on power restoration and staffing resources early next week. Under its current trajectory, the storm is expected to have no impact on the operations of the refineries in the nearby states of Tennessee and Alabama. As of Thursday morning, nearly 850 industrial plants are in in the most powerful path of the storm, while another 1,840 industrial plants are projected to be in the outermost bands. Stay tuned to Industrial Info's Disaster Impact Tracker tool to monitor the status of power plants once the storm has passed. Typhoon Mangkhut has become even stronger, reaching Category 5 strength and being referred to locally as a super typhoon. More than 50 industrial plants in the northern region of the Philippines will be exposed to the threat of hurricane-force winds by Saturday, where the typhoon is expected to weaken to a Category 4 storm. Rice and corn crops are expected to sustain significant damage. Hong Kong and the Guangdong province on the southern coast of China, where millions live and more than 2,700 industrial plants are located, will begin to feel the impact of this massive storm on Sunday. At least six petroleum refineries, five petrochemical complexes and more than 100 power plants are within the most intense wind and rain paths currently being projected for the storm. Industrial Info's team of researchers will be monitoring these plants closely. 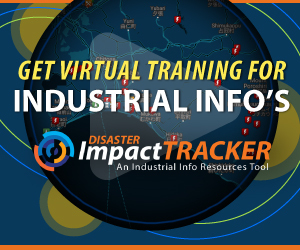 Plants that must close or idle due to the storm will be easily identifiable using Industrial Info's Disaster Impact Tracker tool. Hurricane Florence has shifted its path slightly south, posing a threat to an even larger group of industrial plant assets. There are now more than 1,800 plants in the current path of the storm that could face extreme winds and torrential rain starting Thursday. At least 11 power plants producing more than 6,570 megawatts lie within the direct path of the storm's most intense wind projections. One of these power plants is the large Brunswick Nuclear Power station, which is owned by Duke Energy. Additionally, another 95 industrial plants are within this same path, most of which have already begun to idle operations and reduce staffing to safety and essential personnel only. Among these are several large pharmaceutical plants, food processing plants, fuel terminals and more. 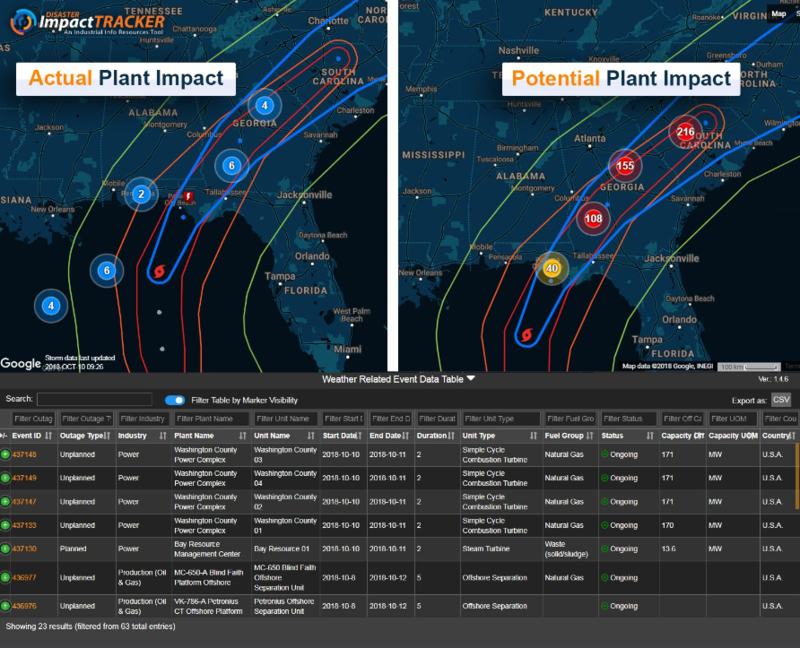 Which specific plants potentially will be impacted are regularly updated and available via Industrial Info's Disaster Impact Tracker, so be sure to log on and keep track of the storm's progress and impact. As Hurricane Florence maintains its strength as a Category 4 storm, industrial plant owners along the coasts of North Carolina, South Carolina and Virginia are preparing for extreme wind and record rainfall that could lead to flooding. Hundreds of industrial plants across all industries plan to idle production beginning Tuesday or Wednesday, and are reducing staff to essential personnel. The movement of the storm's path a little further north over the past few hours, increases the number of plants potentially impacted by the most intense hurricane-force winds to more than 875. Water levels in regional lakes are being lowered in anticipation of record rainfall, and this will continue for several days. Nuclear power plants in the potential storm path will be required to shut down if wind speeds reach or exceed 73 miles per hour. Decisions whether to shut down those plants will likely be made on Thursday, based on the storm's path at that time. Eleven power plants, producing a combined 2,673 megawatts, lie in the path of the most intense storm projection. Tropical Storm Isaac is expected to touch the Antilles between Tuesday night and Wednesday morning. 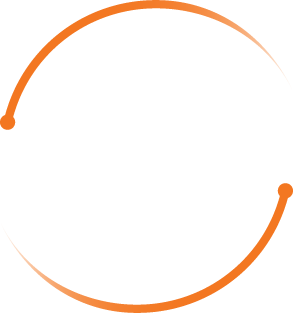 Industrial Info's research teams have confirmed power plant operators in Aruba, Dominica, Antigua and Barbuda, Saint Lucia, Martinique and Guadeloupe were operating normally as of the time of this alert. The storm is expected to progress west and hit the Dominican Republic late Friday, and only heavy rains are expected at that time. Petroleum refiners in the region continue to run at normal rates despite the approaching storm. PDVSA remains on schedule to restart several units that have been down since early this summer due to electrical problems, with the restart pending for today. The Santo Domingo (Haina) Port continues routine operations. Typhoon Mangkhut potentially threatens thousands of industrial plants across Taiwan and the most northern reaches of the Philippines. The storm passed over Guam earlier this week, leaving offline only one 66-megawatt power unit, which was idled out of caution as the storm passed. That unit is expected to resume operations on Wednesday, September 12. Current expectations are that the storm will strengthen over the next few days, dropping large amounts of rain on the eastern and southern parts of Taiwan. Depending on the storm's path, by Friday, the storm could impact operations for at least seven plants in northern Philippines, several of which are windfarm power-generating stations that are all but certain to be idled if the storm's path crosses them. Current weather predictions suggest the storm will likely diminish in size and intensity by the time it makes landfall in mainland China, reducing the risk of damage to thousands more industrial plants. The Hokkaido island of Japan suffered a 6.7 magnitude earthquake at 3am on September 6, 2018 causing a major landslide, at least one reported fire in a steel mill and major power outages in the immediate area. There are 43 industrial plants located in the area of the earthquake and damage is being assessed. Industrial Info's research team in the region is working to confirm which of the 34 operational power units in the region might have suffered damage or were taken offline temporarily. In preparation for Tropical Storm Gordon making landfall, the Port of New Orleans is closing early to prepare for weather related activities. Freight/Intermodal companies in New Orleans like BNSF are expected to close early today in preparation for possible strengthening of the storm while Norfolk Southern has decided to remain open although closely monitoring Gordon's path and taking the necessary precautions to protect infrastructure and rail equipment. In Mississippi, the Port of Gulfport has also decided to close early in preparation for the storm approaching. To add this widget to your dashboard, click Add a Widget, and then choose "Disaster Impact Tracker" within the Application Widgets section along the left. Choose "Current Natural Disasters" from the list of available widgets to add, and choose "Add This Widget." Choose to "Return to Dashboard." Your new widget is now available within your dashboard, and can be re-sized or moved based on your needs.